Anna Loise Lewis Oakes was born May 26, 1932, in Oklahoma City OK, to Lonnie Lewis and Loise Thomas. 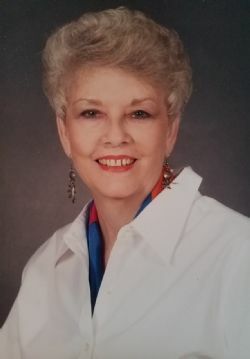 Anna died September 10, 2018, at her son’s home in Lake Jackson, Texas. Anna was a Mother, Grandmother, & Great Grandmother. She as a 5 time Cancer Survivor, Dow Retiree, and spent the rest of her time volunteering for those who needed a helping hand. She was active in the Head Start program in both Midland Michigan and Freeport Texas, Boys & Girls Club, Center for Addicts, and a CASA Advocate. She will be missed dearly by her loved ones and friends, who will remember her for her strength, beauty, and charisma. We will miss her infectious laughter and inherent ability to make everyone feel welcome. Left to cherish her memories are her husband, Billy Dean; her son Robin and wife, Dianna; her grandson Jason; Ryan and wife Donna; her granddaughter Lara and husband, Matthew; her great-grandchildren, Kaylie, Caiden, Joseph, Ivree, Lily, Zerylynn, Alex, Joaquin, and many others who have blessed Robin and Dianna’s home; her nieces and nephews Traci, Randy, Jerry-Don, Dwayne, Cindy, Bobby Joe, Dawn, & Jodi. Anna was preceded in death by her brother’s Bobby & Donny; her sister Janet; and son Philip. A memorial service to honor and celebrate Anna’s life will be held Friday, September 14, 2018 from 10 a.m. to 11:00 a.m. at Willow Drive Baptist Church in Lake Jackson. There will be a reception held at the Willow Drive Baptist Church after the service. Please visit our website to leave online condolences at www.lakewoodfuneralchapel.com. light a candle and send floral arrangements or gifts to Willow Drive Baptist Church. The church will receive flowers at 8:30am.